Be the first to share your favorite memory, photo or story of Magdalene. This memorial page is dedicated for family, friends and future generations to celebrate the life of their loved one. 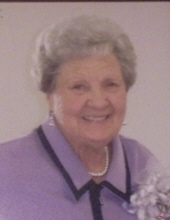 Funeral services for Magdalene Stroud Mills Hunter, 87, of Kershaw, will be held at 2:00 o’clock p.m., Sunday, January 13, in the chapel of Baker Funeral Home. The Rev. Bryant D. Fersner, Bobby Massey and Mr. Ronnie Stroud will office. Burial will follow in the Kershaw City Cemetery. Mrs. Hunter passed away, Friday, January 11, at her home. Born in Kershaw, she was a daughter of the late Henry S. Stroud and Lelar Robinson Stroud. Mrs. Stroud had worked for Springs Industries, Small’s Food Center and Tic-Tac . She later opened and operated Mills Grocery for a number of years. She was a member of First Baptist Church where she also assisted with teaching Sunday School. Some of her favorite pastimes were crappie fishing, gardening, working in her flower beds, crocheting and quilting. She was also a member of the Order of the Eastern Star Heath Springs Chapter. Magdalene was thought of by her family as a virtuous woman who loved God, her family, and everyone. To know her was to love her. She had a caring, compassionate spirit and smile. She loved to laugh and make others laugh. Magdalene made everyone feel welcome at her grocery store where all could stop in and socialize. Surviving are her daughter, Vivian M. Ray and her husband Benny; her son, Charles Reese Mills and his wife Alane; 4 grandchildren, Holly F. (Troy) Helms, Deanna F. (Marty) Waters, Kristi M. (Kyle) Bowers and Charles Reese (Amanda) Mills, Jr.; 4 step-grandchildren, Brian Ray, Nikki (Archie) Nelson, Emily R. Bennett and Greg Bennett and 15 great grandchildren. In addition to her parents, she was preceded in death by her first husband, Bride Junior “B.J.” Mills and her second husband, Carl E. “Buck” Hunter; a son, Howard H. Mills and 7 brothers and 7 sisters. Memorial contributions in memory of Mrs. Hunter may be made to the Alzheimer’s Association, 225 N. Michigan Ave., Fl 17, Chicago, IL 60601. The family will receive friends, Saturday, January 12 from 5 to 7 p.m. at Baker Funeral Home and other times at the home. Baker Funeral Home is serving the Hunter family. To plant a tree in memory of Magdalene S. Hunter, please visit our Tribute Store. "Email Address" would like to share the life celebration of Magdalene S. Hunter. Click on the "link" to go to share a favorite memory or leave a condolence message for the family.